The mountain has much for a barbarian to aspire to: incomparable endurance, incontestable resilience, and might beyond measure. Any berserk warrior can attempt emulate this. Only those with the earth in their blood can truly attempt to be the mountain, to make their flesh, their bones, their very breath the stuff of stone. 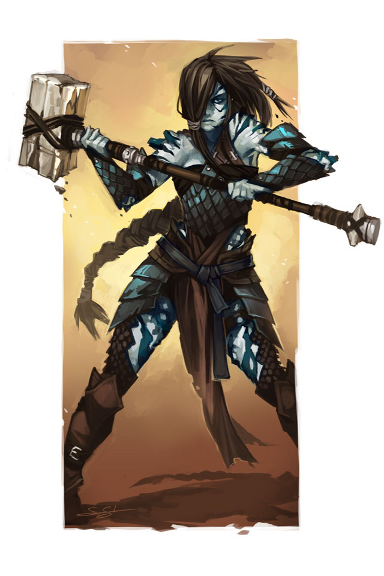 Those earth genasi who truly master this path become warriors capable of reshaping the battlefield around them, enduring hardships both physical and mental, and swimming through the very fabric of the world. Only earth genasi can pursue the Path of the Mountainblood, as only they have the innate connection to the essence of elemental Earth necessary. Your DM can lift this restriction to better suit the campaign. Starting at 3rd level when you select this Path, you learn the mold earth cantrip if you don't already know it. Your spellcasting ability for it is Constitution. At 3rd level, your battle furies channel the cold, inexorable anger of the mountain. While raging, you add your Rage Damage bonus to all rolls made to resist being knocked prone or being moved involuntarily. In addition, while raging, you also add your Rage Damage bonus to all shove attempts you make, and on a successful shove attempt you may push the target up to your Rage Damage bonus times 5 feet. Finally, when you successfully push a creature into a solid object with a shove attempt, and they have yet to move the full distance you pushed them, they take bludgeoning damage equal to your Strength modifier + 1d6 per 5ft they have left to move. Starting at 6th level, you can feel the earth around you as a very extension of yourself. You have tremorsense with a radius of your proficiency bonus times 5 feet. In addition, when wearing armour made of stone or metal in which you are proficient, you can ignore any disadvantage that armour would impose on Stealth checks, the earth you wear a second skin for you. At 10th level, your body and mind are infused with the enduring patience of stone. You have advantage on saves against charm, exhaustion and fear. Additionally, you can expend a use of rage to cause all Deception, Intimidate and Persuasion checks made against you to have disadvantage for a number of minutes equal to your Rage Damage bonus. Upon reaching 14th level, you truly become one with the earth. You no longer need to breathe whilst you are in contact with nonmagical, unworked earth or stone, and the damage dealt by your Unassailable Mountain Spirit increases to your Strength modifier + 1d8 per 5 feet the target of your shove has left to move. Furthermore, while raging, spaces you move through becomes non-magical difficult terrain for 1 minute. Additionally, the space in a 5 foot radius around you is considered magical difficult terrain to hostile creatures. Finally, you also gain a burrow speed equal to your walking speed speed while raging. You can burrow through non-magical, unworked earth and stone and while doing so, you don't disturb the material you move through. so I've taken a stab at this. Thoughts would be appreciated! Last edited by Edge; 2017-07-07 at 03:16 PM. when you successfully push a creature into a solid object with a shove attempt, and they have yet to move the full distance you pushed them, they take bludgeoning damage equal to your Strength modifier + Proficiency per 5ft they have left to move. For third level characters this would be strength mod + 2 per 5 feet. By 17th level, it's reaches its max of str mod +6 damage per 5 feet. I think this smooths out the spike in usefulness early on while making it viable into the late game. It leaves you with having to tweak the 14th level feature Indomitable Mountain Apex (since the 1d8 per 5 feet is a slight downgrade), but I think scaling the earlier feature makes this a problem worth having. I'm also not a fan of including a racial restriction to any class within the class definition. This hearkens back to one of the flaws I disliked in earlier versions of DnD. While the no-stealth disadvantage in metal or stone armor feature seems custom tailored to this race, it could also be a product of a culture's close affinity to the earth. This doesn't impact the class definition significantly either way, so yeah, I think the campaign world should dictate whether there's a race restriction here. Very good stuff. Thanks for sharing! I feel like I should have maybe worded this better. To clarify, it's only supposed to be the d6s that increase with distance. So, if you push them into a wall, and they still have 10ft left to move, then they'd take 2d6+Strength modifier damage - comparable with a greatsword or maul. As it is, the potential damage scales as your Rage Damage bonus increases, since the maximum distance you can shove someone increases with it. But, initially, it deals damage comparable to a barbarian's normal attacks, but with the additional benefit of control. It is intended more as a control feature than a damage one - barbarians aren't exactly lacking in that department. Agreed. Honestly, I was just following the paradigm laid out by the Battlerager barbarian in the Sword Coast Adventurer's Guide. I could see this Path being opened up to dwarves, goliaths and the like. Thanks for the review! Glad you enjoyed. Last edited by Edge; 2017-06-30 at 01:50 PM. The funny bit is, the "mountain rage" bit was originally a Goliath ACF in Races of Stone anyway. This seems pretty darn solid. My only real concerns are with formatting and wording. In addition, while raging, you also add your Rage Damage bonus to all shove attempts you make, and on a successful shove attempt you may push the target an additional 5ft per point of your Rage Damage bonus. To keep it in line with typical wording in the books, I'd change this to something like "your Rage Damage bonus times 5 feet." Same for the radius in "Stone as Self Internalisation." Upon reaching 14th level, you truly become one with the earth. While raging, squares you move through become difficult terrain until the end of the encounter. Furthermore, any squares adjacent to you are considered difficult terrain to hostile creatures. Since 5e doesn't use squares as a moving unit, this should ideally be "space you pass through" and something like "space within a 5 foot radius of you." Also, "until the end of the encounter" should be changed to a hard time limit, like 1 minute or so. Additionally, it's important to distinguish whether this difficult terrain is considered magical or nonmagical - this could be important for stuff like Land's Stride. Even when not raging, you no longer need to breathe whilst you are in contact with nonmagical, unworked earth or stone. Formatting would be easier if this were placed before the rage-only abilities. Finally, the damage dealt by your Unassailable Mountain Spirit increases to your Strength modifier + 1d8 per 5ft the target of your shove has left to move. Similarly, this would be simpler if it was included in the text of U.M.S. as a 14th-level upgrade. Again, despite the nitpicking, pretty darn solid. I may have to use this in my new genasi-heavy setting, if you approve. Last edited by jinjitsu; 2017-07-06 at 01:00 AM. This is all really helpful, especially the 5e wording consistency notes. Sometimes I slip back to my 3.5e homebrewing days. By all means! I wouldn't post it if I didn't want other people to use it. Last edited by Edge; 2017-07-06 at 02:31 AM.